It’s the last day of 2015 and I have to say that this year has flown by faster than a round of Quiz Up on my cell phone. It was a great year filled with great memories thanks to great friends, great live shows at places like Tings an’ Times, Aandklas, Rumours Lounge, Arcade Empire, Carnival City and the Good Luck Bar and amazing festivals like Oppikoppi, Otterlake Easter Festival, Sowing The Seeds, Rise & Shine Festival, Park Acoustics, Capital Craft, MoRock, STRAB and Parklife. Lots of beers and Jose Cuervo shots were had and it has definitely been one hell of a ride. It was amazing experiencing the random comments in between songs from the Modest Mouse frontman at Parklife, being mesmerized and turned into an instant fan by Portugal The Man, singing along with Paolo Nutini in the rain at Sowing The Seeds, running around in circles with my friends during Gogol Bordello’s set at Oppikoppi and I loved taking a trip down memory lane to the 90’s with Ed Kowalczyk at Carnival City. A huge thumbs up goes out to everyone involved in organizing events like Park Acoustics, Parklife, Oppikoppi, STRAB, Blood Brothers and the guys and girls who run venues like Aandklas, Arcade Empire, Rumours Lounge, Railways Cafe and Tings an’ Times. Thanks for keeping local music alive. Another huge thumbs up to all the SA Artists for keeping the dream alive. South Africa would be a lot more boring without people like Francois Van Coke, Jack Parow, Karen Zoid and Matthew Mole and bands like Shortstraw, Shadowclub, The Black Cat Bones, Van Coke Kartel, Lectric Monks, The Narrow, Desmond & the Tutus and Gangs of Ballet (to name just a few). To relive some of the great moments of 2015 I posted 50 updates on Instagram featuring 200 of the best photos of the year. Here’s a collage of ALL of them. Kudos to all of you who have supported Running Wolf’s Rant in 2015. It’s been one hell of year for this blog. 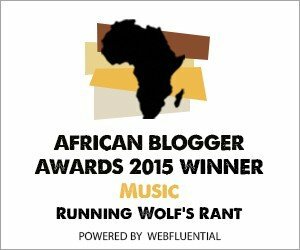 Thanks to you we won the African Blogger Award for Music for 2015. Without your support this would not be possible. Here’s to a great 2016! Things can only get better from here! Next article2015’s would-be biggest movies – What happened?